We quickly learned during our time in language school that the best way to get around the city of Campinas was to use the bonde–the Brazilian streetcar. From this picture, it isn’t much like any streetcar Doris and I knew in Toronto or Ottawa. Yes, there were seats with access to them made easy for there was a board along each side of the bonde that provided a step up. But it was not quite that simple. 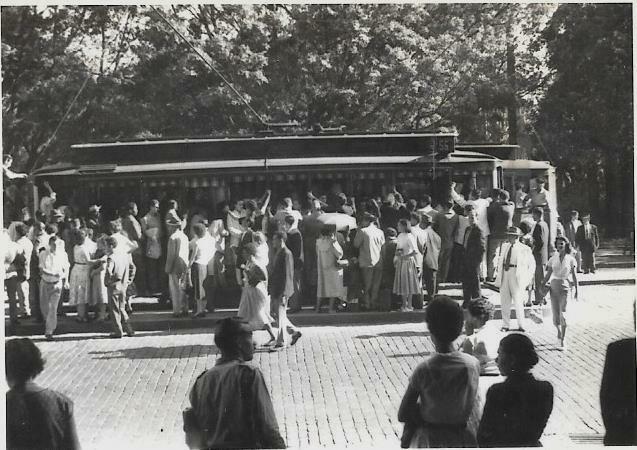 Many riders simply stepped up to that running board, held on to an available strap and completed their trip to later simply step down. Often this happened in the crowd coming or going at the stops in the downtown areas. In that confusion a collector made his way picking up the fares. Doris may at the right—she would make the trip alone to school since her classes were in the afternoon and mine in the morning. Learning about bondes came quickly for the other option was walk. With our move to the interior of the state of São Paulo almost a day’s travel away, we often used the train for the buses were uncomfortable and open to the red dust from the dirt roads. 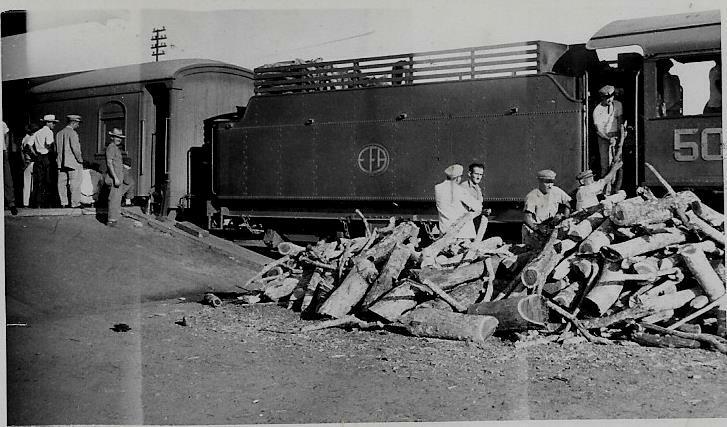 At that time Brazil did not have its own petroleum or coal so the locomotives used what they had—that was eucalyptus logs. Along the way Doris and our family made friends with folks who farmed the quick-growing eucalyptus for the trains. Here the logs are loaded on for the next section of the trip. 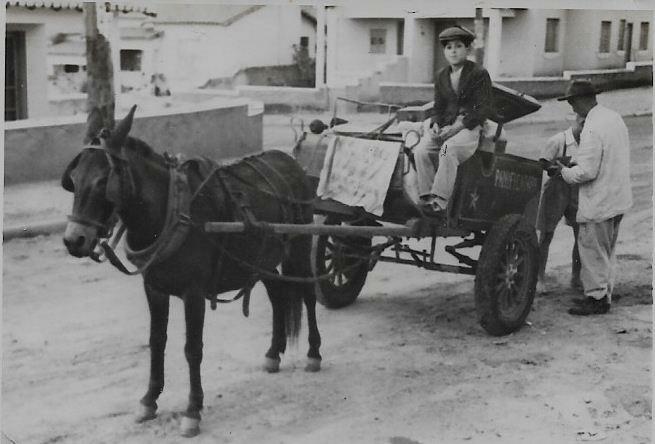 The taxis we could most easily find at the train station were what this picture shows—a donkey-drawn two wheeled cart that was known as a charrete. It did not matter that the donkey moved slowly for the charrete got us to our home with our children and luggage. Mind you, there was no room to spare but the fee was reasonable and we felt quite like Brazilians riding in a charrete. 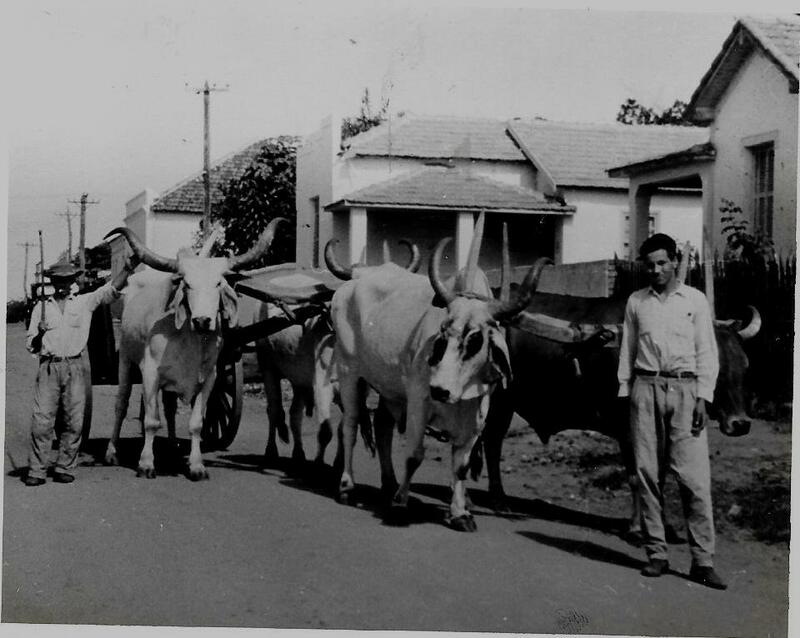 I am not sure that while living out among the coffee plantations that we ever hired a cart and oxen to move anything for us. Yet this picture came up among those taken in Neves Paulista and it fits well even though my memory of the how and when it was taken are lost. This was our apartment just behind the hall used for services but important for this blog is the 38 Ford car parked close to our kitchen door, next to our parrot and its perch. Brazilians loved that car in those days because it was built high and great for the mud and ruts of so many of the roads. A Christian friend in São Paulo offered it to us and I sent a cablegram home hoping the H.M. mission might invest $5,000 in it. The cable office deleted one zero and the mission O.K’d $500. The mistake was discovered too late and my parents made up the difference to the mission over the next number of months. Ouch. 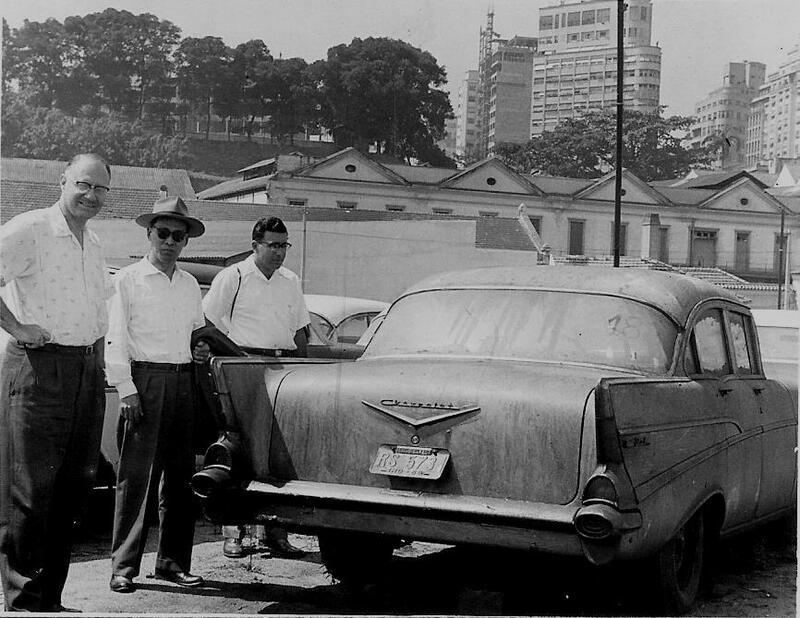 The ’55 Plymouth that we shipped to Brazil for our first term was captured by customs in the port of Santos and stayed there till during our second term in Brazil. 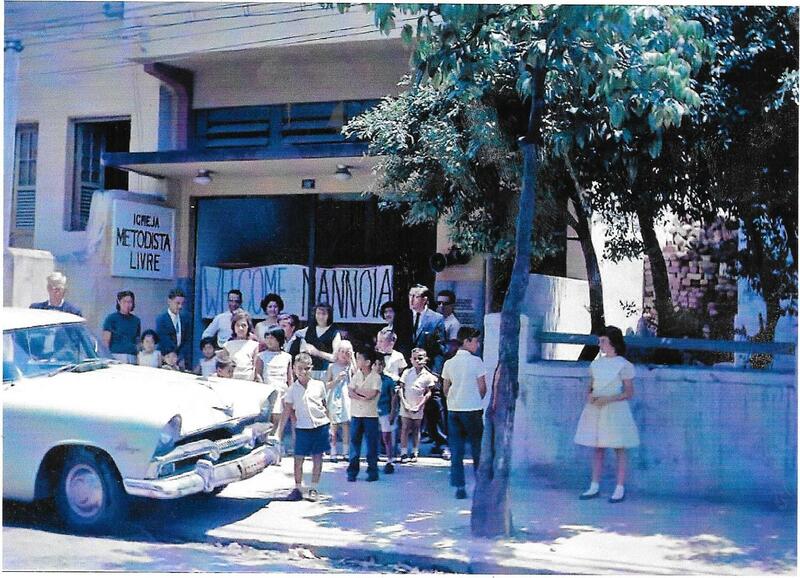 When we got off the ship to our work of church planting, we were assigned to Rio de Janeiro. Even though we had no experience of the big cities yet the Lord allowed many good things to come out of it. One: a lawyer was able to get the car free with a “writ of habeus corpus.” This car is parked in front of the hall where we began services in Rio. With my experience with lawyers and courts behind me, I was able to get freed a ’57 Chev, a mission car that had been parked at the Rio docks for a couple of years or more. Brazil then did not allow the importation of cars for they were developing their own auto industry. As I look back over those experiences I am able to say with the Scriptures, “All things work together for good to those who love the Lord.” Of course some of those roads we took were tied in with difficulties we never faced before. But we are able to say that God’s guidance and help were just as evident to us as in the words written by the Psalmist, “The Lord is my shepherd, I shall not want.” My concern for every reader, no matter the road where you find yourself, is to make Jesus your shepherd. You will not regret that decision in this life and in the next. This entry was posted in Uncategorized on August 23, 2017 by rkenny2014.